Thank you all for reading my work so far! I love making it so much, but obviously free comics often get pushed aside when I have paid work. 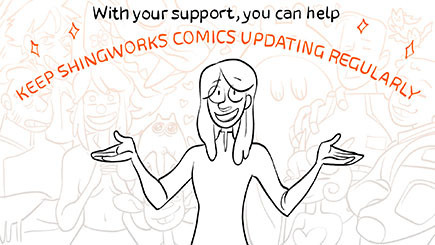 Turning webcomics into paid work pretty much takes care of that problem, and lets me guarantee regular updates. If you’re just seeing the campaign for the first time, then a lot of the heavy lifting has already been done for you, including 6 unlocked comics as well as guaranteed scheduled 2x a week updates :U Now is a great time to get in on all these extra comics, page previews of upcoming updates, livestreams, and maybe even pick up some more personalized goodies from me as well. Because we hit the 2x a week updates goal, the new update schedule goes into effect immediately. Mare Internum will now update early Monday at 12AM (PST), and The Meek will update early Wednesdays at the same hour. We are not yet at 3x guaranteed updates (and I am continuing to work on side freelance because of that) but I will always aim to do 3x updates a week if possible. That potential third page (of either comic, I will probably switch between the two) will be up on Friday of Sat if it is going up at all. Anyhow, thank you for reading, as usual, and see you again in a few days. I can’t tell if you’re talking about him or me, haha. Either way it’s unlikely but keeps happening. It’s so interesting to watch Mike swing between suicide and struggle for survival. When he’s alone or safe he considers suicide, but when he’s in pain he fights with whatever he has to keep going. I just love the realism. His eyes are creeping me out. And the overall claustrophibic feeling of him in that tiny circle of light. And wow! Those water splashes! This must have taken you HOURS. I know, right. I keep taking the drops like I’m supposed to but something always happens and it gets red again. So, on Monday MI will be same time as Gunnerkrigg Court! That’s definitely a good company! No problem, I can handle this! That patreon thing requires me to permit more scripts than I feel comfy about. But I found your paypal button now! XD That’ll do. As one internet paranoid (though also web developer) to another: Patreon doesn’t have any bad things there, just a bunch of standard frameworks. Seconding DukeBG; Patreon makes a lot of calls to Amazon S3, which plays havoc with NoScript but a one-time allow is all it takes to sign up and make payment arrangements. After that you don’t have to allow the extra script calls just to view the subscriber content. Suggestion: uMatrix lets you block things per website. So you can allow Amazon AWS on Patreon without allowing it everywhere else. Oh, those water splashes just look so beautifully liquid. And the ripples in the second panel too. This page is unbelievably beautiful. And it makes me so stressed out for Bex!!! quick mike bust out of your space suit like the incredible red hulk !! I choose to believe that the suit is literally projecting the word “BEEEEEEP” onto the inside of his helmet, instead of it being a SFX. I love how his… Gasp? is also inside the helmet… is that 1% O2 I read? I had grown way too attached to his character, potential instabilities and all. Burst blood vessels in the eye (I’ve had those) and all, I’m glad he lives. Lessee… if this is a sealed pocket above an ocean, there is a possibility of both pressure and oxygen in there (especially given that all bets about what we know of Mars are now off in light of Mike’s “discovery”). If the life forms below (if life forms they were!) excrete oxygen, it would collect there after all the exposed rocks became oxidized. If there’s a source of radioactivity, radiolytic splitting could (over the course of thousands of years) separate out enough oxygen to permeate a small area… of course it would separate out twice as much hydrogen, so he’d better not try lighting a match. As for pressure, well, the bubble should be the same pressure as the water below it, and if that water is liquid, that should be sufficient pressure for his suit reclamation to process it into sort-of breathable atmosphere. Assuming the reclaimer isn’t completely destroyed. Which it probably is. Good luck, Mike, you’re making Mark Watney look like a tourist by comparison. Oxygen does tend to make life a bit more pleasant for Terrans. As far as Martian atmosphere, it’s roughly 0.01% standard Earth sea level pressure. 95% carbon dioxide, 2% nitrogen, 2% argon, and trace amounts of oxgen & carbon monoxide. I could be argued that the cave was sealed before the collapse but it’s not anymore. I thought it was more around 10% of Earth atmosphere pressure, but I looked it up, and it’s about 0.6%. I’m wondering, though, if the atmosphere in the cave were completely displaced so it was near 100% O2, would it technically be enough for a human to survive? Mars atmosphere is around 600 pa., and I know that’s low enough that the water in your lungs would boil off, killing within minutes. I guess temperature would also play a key factor. And the water (assuming it’s even water) in the cave is liquid. Anyway, I think that it’s safe to conclude that in our reality, Mike would not survive in any possible Martian atmosphere (unless highly pressurized). Pure Oxygen at low pressure? What could possibly go wrong? Ah, but, see, Mike traversed a narrow tunnel and has surfaced in what appears to be a sealed air pocket above the sea, not the (definitely unsealed) chasm he fell into originally. His depth below the surface alone means the pressure here is higher than Martian standard, but more importantly the pressure from the water below means it could be the hundred-times-higher that the lungs need to survive. I think the suits seal is compromised because he undid the latches on his helmet. It wasn’t too bad when he was under water. At earth gravity, every 10ft adds 1atm of pressure. Now that he’s surfaced, he need to do the latches asap. Urgh, I can’t help taking a deep breath when looking at this page. If the suit PLSS stops working, Mike would lose consciousness long before oxygen drops so low due to carbon dioxyde buildup, so I’m assuming the 1% readout is about oxygen left “in the tanks”, but the air in the suit is still in the good enough conditions to stay conscious. Possible it’s oxygen left in “tanks” or that it’s operating at 1% of normal oxygen making capacity due to damage. Indications are that he had very low pressure as well, so low oxygen (possibly high carbon dioxide) percentages in the air but not much air to breathe and absorb. Could also be a rapid loss of air or drop in O2 levels, rather than gradual. Haha, yeah some buttons and such are going up in a few days! I figure I would let it breathe in the comments first before slamming the site itself. Ahahaha I love this comment… You are defs free to root for the cave, if you want. The next 4 chapters are just a single shot of Mike lying dead in the cave. Chapter five slowly fades to black as the suit battery fails and his helmet lights go out. The end. 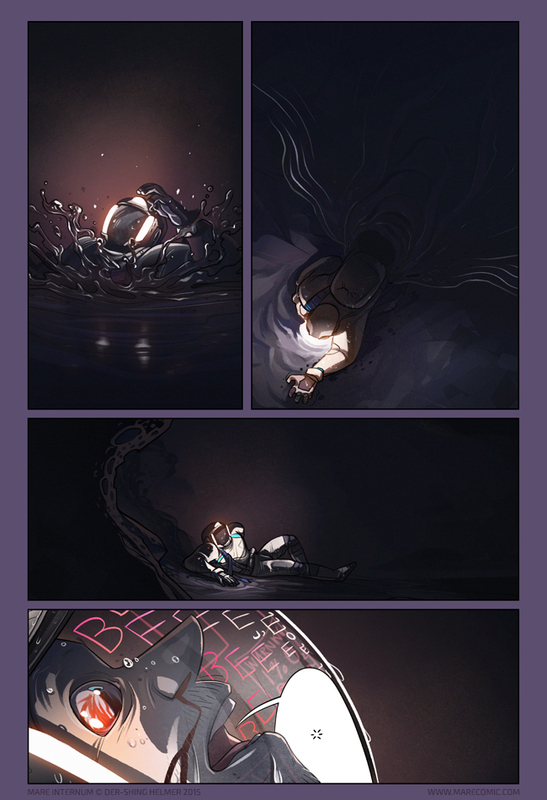 It’s just incredible how you convey the sense of claustrophobia and suffocation amid Vast Dark Unknown in this and the previous page. Brilliant light/color and framing. dang my science nerd side was kind of hoping for breathable martian water and ADVENTURES UNDER THE SEA. Anyways glad to see Mike is alive for now at least. Hey SG! Yep, it’s one of the big inspirations for MI… Mike’s middle name (on a package a few pages ago) is a bit of an homage. Please don’t hurt yourself working too hard, miz! Haha, don’t worry about me… if I can blow my arms out working on comics, it will be a happy death. Incredible punch on the zoom in that last panel!! Your sense of when to understate information VS when to go full ham is utterly on point. Adore the way the comics medium is being warped by his helmet. Very creative detail that really sells the distribution of sound. Great to have you back! I hope you have been well. These new features are exciting. I hope they are met with enthusiasm from your fan base. Lol I just realized the strange juxtaposition of this page, Mike gasping for life, and you scroll down with a happy drawing of you with news that you’ve launched your patreon hahahah. Hm, well, instinct, I guess? I pencilled the second and third panels originally with him crawling towards the viewer with a foreshortened arm reaching out towards “us,” but that is very horror-book cover to me, sort of threatening, and not the right tone. A side angle feels too close and yet too impersonal, like taking a video of a car accident. So far shots/ overhead shots seemed safer, much more clinical/ documentaryish, and give a bigger impact leading to the zoomed 4th panel. Also, I didn’t mean to sound so happy about Mike terrified and suffocating. I ain’t rootin’ for the cave! Gah, I’m glad he’s finally out of the Deep Dark. That was just..Not nice. I don’t like the open ocean and all the deep-water stuff anyways, and having it simultaneously be in an underground, bottomless chasm? That was kinda scary. Anyways, great, great job with all of the color. That cave looks pretty small. I wonder how (if?) he’s getting out of this one. “….. and with one bound, he was free!” Do keep up! I see I’m not the only one to be thinking “Mark Watney”. That book is actually pretty good science, while MI seems to be pretty much the same background one generation forwards. I’ve also had more training than I want over the years on all the crappy things you can do with a BA set on, including being submerged in the “Dark Tank” on the Mines Rescue course (which gets my all-time vote for Worst_Course_Ever, by the way) and the Escape Tower at HMS Vernon. So, here’s some suggested parameters..
1) Bex MUST find the cavern and/or Mike finds his way out. I’ll do like in the movies : I will hold my breath untill you post the next page, by support for him.